Mark and Jay Briscoe are now 10x ROH World Tag Team Champions. The brothers defeated SCU (Kazarian and Scorpio Sky) as well as the Young Bucks tonight at Final Battle 2018. 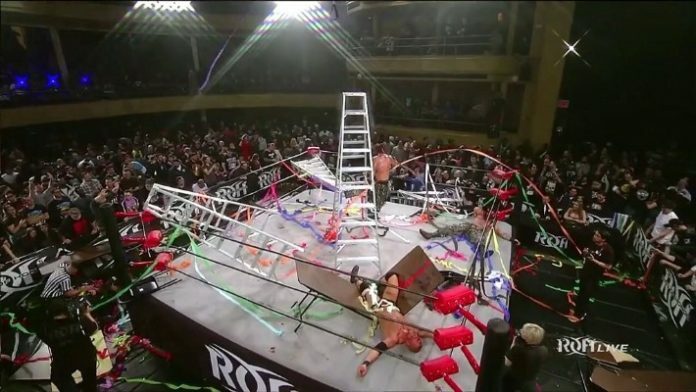 After a bloody and brutal Ladder War VII, Mark Briscoe stood atop the ladder in Hammerstein Ballroom with both belts above his head. The Briscoes have held the ROH World Tag Team titles a combined total of 1,026 days. ROH will tape television in Philadelphia tomorrow. They are then off for the remainder of the year before taping television again in January and beginning the road to the G1 Supercard in Madison Square Garden this April.